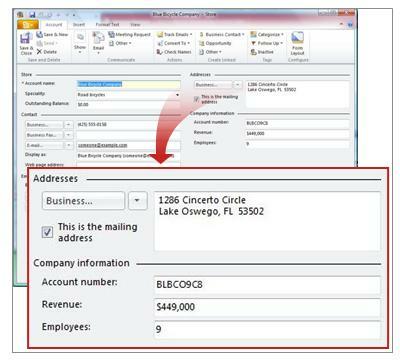 In Business Contact Manager for Outlook, information about the companies and people you do business with is stored in either Account or Business Contact records. These record types can both be changed to match the organizations and customers you work with. Adventure Works created a Vendor form for the companies that supply bicycle parts or finished products to Adventure Works, and a Stores form for the stores that buy products from Adventure Works. If you haven't already, you must first switch to the Sample Business database to use the Adventure Works business data for your practice. Click Manage Databases, and then click Switch to Sample Business. Note: Don't worry, the database that you use for your own business is not affected by your temporary use of the sample business database. Confirm the name of the Assistant Manager for the Blue Bicycle company, which is one of the vendors for Adventure Works. 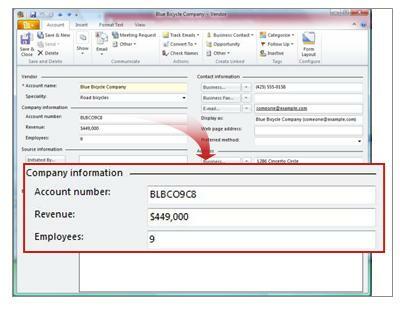 In the Navigation Pane, under Business Contact Manager, click Contact Management. In the Contact Management workspace, click the Vendors tab. Double-click Blue Bicycle Company to open the record. The name of the company and their speciality. Company information includes the Adventure Works Account number, the annual revenue, and the number of employees. 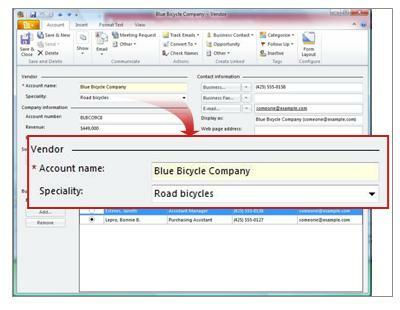 On the Blue Bicycle Company Vendor record, in the Business Contacts section, double-click Lepro, Bonnie B to open the record. Read the note in the Comments section. The note in the Comments section of the Bonnie B. Lepro record mentions that a new store opened this year. Ms. Lepro is the Purchasing Assistant of the Blue Bicycle Company which is now no longer a Vendor. Blue Bicycle company is a store that Adventure Works will want to sell to rather than buy from. Convert the Blue Bicycle Company Vendor record to a Store record. On the Ribbon in the Blue Bicycle Company Vendor record, in the Edit group, click Convert To , and then click Store. The label changed from Vendor to Store. 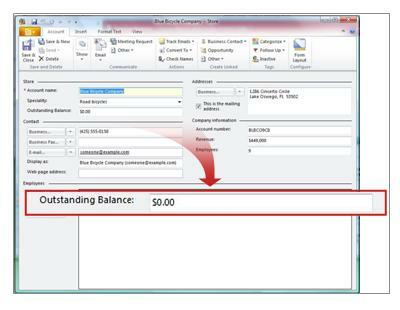 In the Store section, the outstanding balance field is displayed. The address and company information are now in the first column.